After signing up for the Turkey Trot yesterday, and worrying about whether I'd be able to finish in the required amount of time, I decided to do a "test run" today. I had four miles on the schedule, so instead of doing them at an easy pace, I wanted to try to run 8:50-ish per mile. 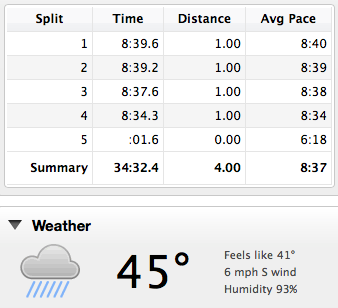 That's the pace I would need to hold for a sub-55:00 10K. Looking back on my training for the year, about 99% of my mileage was "easy". Even the races I did were just for fun, or pacing someone slower than me. The only race that I really ran hard was the Martian Meteor 5K in April. It was my younger brother's first 5K, and he just said he wanted to aim for sub-9:00's. I assumed that meant close to 8:59, but he made it challenging ;) I did my best to keep up with him, and finished in 26:11 (8:25/mi pace). Nowhere near a PR, but that was the last race that I really gave a lot of effort. I am so glad I took a break from racing for 2014, becauseI just felt sort of burnt out after training so hard for the Chicago Marathon. On the other hand, I think one of the reasons I backed off of racing hard was because I knew a PR was out of reach. Having gained weight, my pace slowed from what it was 2013; and even running my best, I knew that I wouldn't PR. So rather than trying my best, I just took it easy instead. Not the smartest attitude to have, but it wasn't something I did consciously. Recently, I have gotten really fired up to race hard again. I know that I won't be setting PR's right now, but I set some short term and long term racing goals that I'd like to aim for. Reaching those will feel almost as good as a PR. 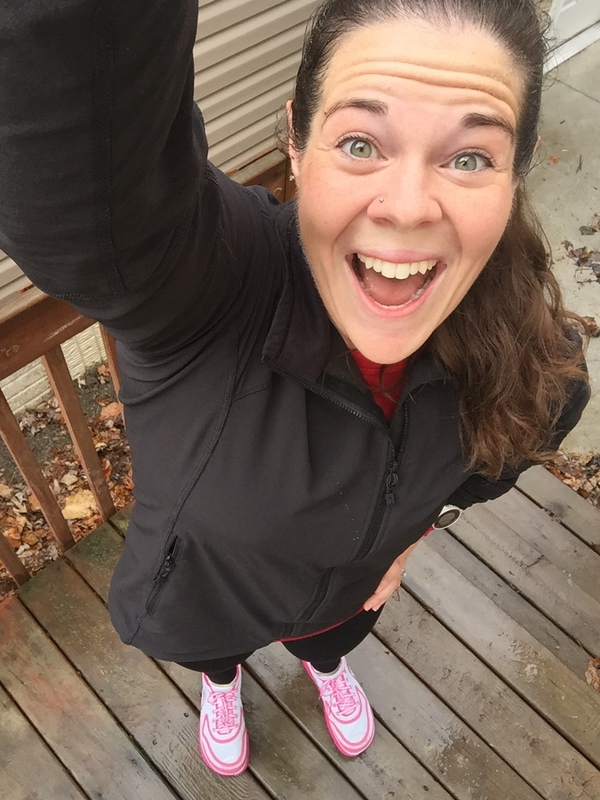 It feels almost like being a new runner again, which is a great feeling, because you see so much progress! So today, I had a goal of sub-9:00 splits, but I was really hoping to hit 8:50's. I figured if I could hit 8:50 for 4 miles, then I *should* be able to hit 9:00-ish for the 10K on Thursday. Today was the perfect running weather! It was 45 degrees, overcast, and drizzling. If I could choose my running weather, that would be exactly what I would choose. I went outside, thought, "Here goes nothing! ", and started running. It always takes me a quarter- to a half-mile to get a good pace; I usually start out too fast, then my pace drops too slow because I'm recovering from starting too fast, and then I find a good balance. That's exactly what happened today. Once I settled into pace, my Garmin read 8:40. That was faster than I'd planned, but I just went with it anyway, figuring I'd slow down for sure after a mile or two. I was really uncomfortable running at that pace, but that's how it's supposed to feel when you're racing (I was treating this as a mock-race in a way). My legs felt really good, but my breathing was tough. So I just tried to focus on the principles of the "Running On Air" book I mentioned--inhale for 3 steps, exhale for 2. I also tried to remember the running form tips that I learned from Golden (founder of Altra shoes). I was trying to focus on anything other than how uncomfortable I felt! My first two splits were almost dead-even: 8:39.6 and 8:39.2. After I turned around (I was doing an out-and-back route), I kept focusing on just making it to mile three. Once I hit mile three, I knew that mentally, it would be a whole lot easier. Knowing I would have just a mile left would help me get through it. I hit mile three just a tad faster, at 8:37.6. I knew then that I would finish, but that last mile was so hard! I reached my house just as my Garmin beeped, and saw my last mile was 8:34.3. I can't even explain how excited I was to have done it! This run wasn't an actual race, it wasn't a PR for distance or speed, it wasn't anything special at all--but I just felt really excited that I'd reached (what I knew would be) a really difficult goal at this point. When I got my fastest in early 2013, that was exactly how it started--just setting small goals for each individual run, getting a little faster each time. It was the same with my weight loss--I would set my sights on all sorts of mini-milestones (my pre-pregnancy weight, my college weight, under 200, my high school weight, etc.). I'm going to try to have the same mindset with my weight loss as I do with the running right now. I want to get excited about each milestone again, instead of thinking about how much I gained this year, or how far I have to go until my goal. Great job Katie, I know you'll do great on Thursday!! So if it gonna be crowded than try to line up towards the front and you won't get held back trying to get into a good groove!! Knew you could do it! You go have fun on Thursday and RUN HARD! wow, that's awesome! love the idea of mini goals. very smart! Great job! I did a 5k this weekend and came in right about 30 minutes so I was pretty happy to get that close to being a sub 30 again. Way to hit it hard! Good luck at the Turkey Trot on Thursday... you'll go sub 55, I know it! nice job on your workout and good luck this thursday!!! I have been having so many ups and downs with running these days.... i havent had a PR in awhile...Ive gained weight and got slower and slower over time which is discouraging. I recently decided that enough was enough...I needed to stop making excuses and stop sulking and just work hard. period. plain and simple. I got back on the wagon and am waking up at the crack of dawn each day to get my workouts in and I feel so good. last week I had a couple of runs like you had today...the...YES I can do this type of runs. I once felt like I would never break my PR from my marathon a few years back but now i know i can do it. and I will do it soon. and when that happens i may cry of tears of joy haha. its having workouts like these that you keep you moving forward and motivated to your goals. Great post. good night! Fantastic, Katie! I have my first TT Thursday. I signed up for the 5K because I'm not sure how my foot will feel (nerve impingement) with the new orthotics. I'm excited to get back out there and race again.